Otto K. E. Heinemann founded the General Phonograph Corporation (GPC) in 1916. GPC’s first record label was Okeh (named after the founder’s initials) in 1918. The Indian Head logo was selected because like the name “Okeh” it was accessible to everyone, even Indians. The General Phonograph Corporation was sold to Columbia Phonograph Company in 1926. Columbia Phonograph Company produced the Okeh label in many different colors (black, blue, red, and maroon) The Columbia Phonograph Company was then sold to American Records Corporation (ARC) in 1934. ARC dropped the Okeh label but when Columbia Broadcasting System (CBS) bought ARC in 1938 it brought back the Okeh label and added the CBS “Note and Mic” logo to the Okeh label. CBS’s “Note and Mic” Logo. Music Genres: Jazz, Blues, “Race” Records, Ethnic records; under ownership of CBS the focus was Western, Country, Rhythm and Blues. Indian Head as logo either in a Red or Blue colored label with black shellac. Record Label: Pre-1920s/early 1920s. Note the Indian Head inside the Okeh label. Based upon the song it was 1918 when this record debuted. Okeh also produced records in a red color. In this example (below), Irving Berlin composed the song You’d Be Surprised in 1919. Billy Murray (the singer not the actor) made his own rendition of the song sometime in the early 1920s. Pre-1920s/early 1920s Okeh Record in Red. The Okeh record (below) is rather interesting. You will note the scripted lettering which was a design change most likely in the early 1920s while Okeh Records still belonged to GPC. However, the term “Electric” was added to many records beginning in 1925-1926 as the technology to produce records changed from simply playing into a large horn and having the records cut to playing into a microphone (with an accompanying amplifier) and having the record cut. Electric records will show more variation in sound. Okeh Record Label 1920s: The label design changed to a flowing script. Some early scripted designs still retained the Indian Head logo. You can listen to Doctor Lloyd and Howard Maxey by clicking on the video below. Note, the song reflects the attitudes towards race at the time of its production (1925-1926). The label below shows the CBS’s “Note and Mic” icon. 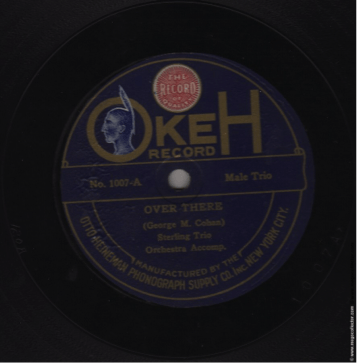 This icon was added to Okeh records produced after 1938 as Okeh was bought by CBS. Numbers from the 1918 to 1945: 1000-45000 (When Okeh was its own label it did not have a 5000 or 6000 series). The 8000 series is the “Race record” series while under CBS the numbers are 5600-6800. Post World War Two Label Examples: By the late 1940s/1950s Okehm turned to 45s and LPs. Both examples below are in a 45-format. Okeh Post World War II label in a 45-format. Notes: Mamie Smith first recorded on the Okeh label with the song, “You Can’t Keep a Good Man Down” in early 1920. This song would sell between 50,000-100,000 records. The record’s success proved that there was market for African-American blues or “Race-Records”. However, her breakout song, “Crazy Blues” was recorded in August 1920 and would go on to sell over 1 million albums within a years time. –Rust, Brian. “The American Record Label Book. Arlington House Publishers.” NY,1978. –Sutton, Allan. “A Guide to Pseudonyms on American Records, 1892-1942.”Greenwood Press, 1993. –Nauck, Kurt and Allan Sutton. “American Record Labels and Companies: An Encyclopedia (1891-1943)”. Mainspring Press, CO.2000.